Come see yachts for sale at this year's New York Boat Show! 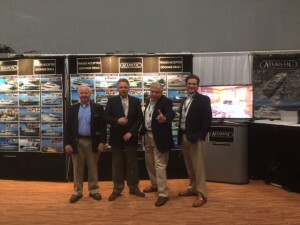 : Atlantic Yacht & Ship, Inc.
It’s day three at the 2016 New York Boat Show and AYS is standing strong in our all new indoor boat show display showing yachts for sale! Located at the impressive Javits Center, the show will run the new few days through Sunday. Tens of thousands of boating and fishing enthusiasts start their season at the New York Boat Show. With its 110-year history the show is recognized as THE place to see the latest and greatest in boating. You name it you’ll see it here first—everything from yachts for sale and cruisers to bass and pontoon boats, from canoes and kayaks to fishing boats and personal watercraft, from marine electronics and engines to fishing gear, and more. Book trip with resorts and travel destinations, too.There’s no better place to buy! The 5-day event is a once-a-year opportunity to compare makes and models, secure insurance and financing and gear up with the latest accessories all at one time! We are located at Booth 666 along the back wall so stop by and say “hello” and check out some of our yachts for sale!